Beauvais Tille is the smallest airport serving Paris. However passengers have plenty of choices to get to and from the airport: Coach, taxi, shuttle and private sedan services. Private vans are a perfect choice for groups of 4 or more as the shuttle don't stop on the way - It is the only real non stop door to door airport shuttle service. It is also the favorite transfer options for Senior citizens, travelers with heavy luggage, disabled persons, or families with small children in tow. Don't make your taxi bill a nightmare : book at flat rate. 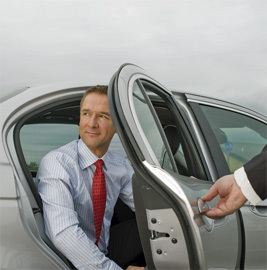 Transfer is operated in comfortable air conditioned vehicles with courteous English speaking drivers. Thank you for visiting our site. We provide on this page a review and a quick comparison of ground transportation services available at Beauvais airport. 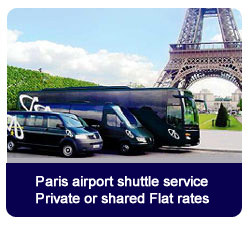 * Estimated price - One way transfer Beauvais - Paris city center.